IRWINDALE, Calif. and MONTREAL, April 16, 2019 /CNW/ -- Canadians now have a fresh, convenient, healthier lunch option to grab on those busy days when the temptation of visiting a drive thru is at its all-time high. The new Bonduelle Fresh Pickedmc ready-to-eat salads are convenient, fresh lunches packed with protein that you can enjoy on-the-go or wherever you are. Fresh Air Sealmc technology extends the shelf life of the salads without preservatives, so they stay fresher longer, allowing meal preppers and busy foodies alike the confidence to stock up for the week in just one grocery trip. These delicious, restaurant-inspired recipes make these new salads the perfect choice for Canada's busy, health-conscious consumer. Each of the five varieties feature crisp farm-fresh leafy greens, deliciously seasoned meats – like chicken, turkey and ham – mouthwatering dressings and a variety of flavourful toppings such as cheese, veggies or crumbled bacon. Crafted by Bonduelle's own culinary team specifically for the tastes of the Canadian consumer, the line-up of salads include favourites like Caesar Salad with Chicken and Bacon or Greek Inspired with Chicken, and were created with high-quality proteins so consumers can enjoy healthier, nutritious meals without compromising taste or quality. "Trends show that 76 percent of consumers struggle with meal ideas1. And we know Canadian consumers want healthier, convenient, fresh meal options with the flavours that satisfy their appetites and taste buds," said Bonduelle Fresh Americas Executive Chef Jeff Haines. "Each of the salads in this new lineup offers just that − cravable flavours Canadian consumers demand, farm-fresh veggies and packed with protein for a satisfying lunch." According to research by Mintel, nearly 50 percent of adults 18-44 say their busy lifestyle makes it difficult to eat healthy. Bonduelle Fresh Pickedmc Salads are the solution. Each comes ready-to-eat – including the fork – with all of the ingredients separated to maintain flavour, crispness and freshness until consumers are ready to mix and enjoy. Each variety makes a satisfying, delicious meal on its own, all under 310 calories with between 9-18 grams of protein, but they also pair well with a sandwich or soup. Consumers can find them now in the produce aisle of Loblaw stores – Loblaws, Zehrs, Provigo, Maxi & Cie and others – in Quebec and Ontario provinces, as well as in the Maritimes. 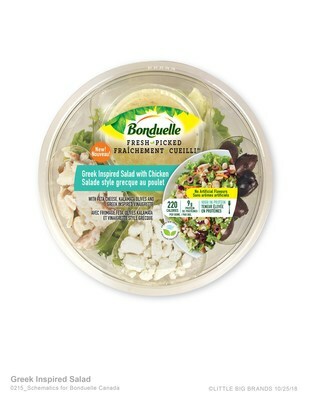 For information about Bonduelle Fresh Pickedmc salads, please visit www.bonduelle.ca. Bonduelle Fresh Americas is a wholly-owned subsidiary of Bonduelle (BON.PA), and the home of the Ready Pac Foods and Bonduelle brands. With four processing facilities throughout the U.S., the business unit focuses on fresh vegetables, salads and fresh meal solutions for the Americas. Acquired by Bonduelle in 2017 as Ready Pac Foods, the renamed Bonduelle Fresh Americas is the newest of the company's five business units. The company manufactures a complete range of products featuring fresh produce and protein under the company's Ready Pac Foods®, Bistro®, Ready Snax®, Cool Cuts®, elevĀte™, Bonduelle Fresh Picked™ and Bonduelle Heat & Eat Harvest Bowl™ brands. Offerings include fresh-cut salads, vegetables, snacking and fresh prepared meals, including warm meal bowls, available where consumers buy groceries and in restaurant chains across North America. Visit Bonduelle Fresh Americas or follow us on Facebook, Twitter and Instagram. Bonduelle, a family business, was established in 1853. Its mission is to be the world reference in well-living through plant-based foods. Prioritizing innovation and long-term vision, the group is diversifying its operations and geographical presence. Its vegetables, grown over more than 130,000 hectares all over the world, are sold in 100 countries under various brand names and through various distribution channels and forms. An expert in agro-industry, with 55 industrial sites or owned agricultural production facilities, Bonduelle produces quality products by selecting the best crop areas close to its customers. Visit www.bonduelle.com/en for more.